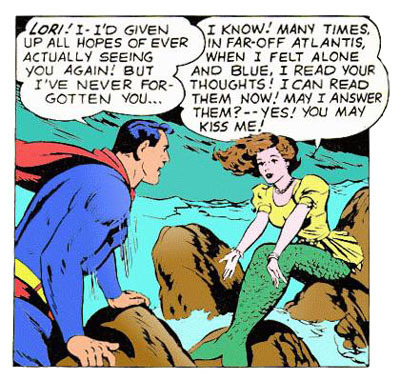 The lovely brown-haired Atlantean mermaid who, prior to her marriage to the extraterrestrial merman surgeon Ronal, remains to this day one of the Man of Steel's most trusted friends. Recalling her wistfully in May 1959, Clark Kent describes her as the kind of girl he's always dreamed of marrying - a girl of rare beauty and courage with eyes as blue and mysterious as the sea and a voiced tinged with the slightest touch of a foreign accent. Residing in the subsea realm of Atlantis with her husband Ronal and her younger sister Lenora, Lori Lemaris is a descendant of Nar Lemaris, the Atlantean scientist who performed the miraculous biological conversion that transformed the people of Atlantis into a population of mer-people (Superman #154, July 1962). Like all Atlanteans, Lori Lemaris has mastered the art of reading minds and of communicating telepathically. She can perform these feats over very long distances, thus enabling her to read Superman's thoughts or summon him by telepathy even while she is in Atlantis and he is in Metropolis, a great distance away. It was by reading Clark Kent's mind that Lori first discovered that Clark Kent is Superman. Lori Lemaris' extraordinary mental powers also enable her to make sea creatures obey her telepathic commands or to tune in on the thoughts of criminals imprisoned in the phantom zone. Although Lori Lemaris, like other Atlanteans, is physically capable of surviving out of water, to remain in perfect health her body must be immersed in salt water at least ten hours a day. Since walking on land is impossible for a fish-tailed Atlantean, Lori Lemaris has customarily employed a wheelchair during her brief sojourns in the surface world, concealing her mermaid tail beneath a blanket so as not to arouse undue attention. Lori Lemaris' status among her fellow Atlanteans is not entirely certain. Several texts portray her as an ordinary Atlantean citizen. At least one text, however, describes her as Atlantis' queen (Superman #156, October 1962) and two others describe her as Atlantis' ruler (Superman #154, July 1962 and Action Comics #300, May 1963). Once every hundred years, according to Superman #129, an Atlantean is chosen by his people to visit the surface world to learn of the surface people's progress during the preceeding century. It was while making one of these visits that Lori Lemaris attended Metropolis University during the period when Clark Kent was a senior there. Kent dated her steadily during this period, captivated by her courage and haunting beauty, falling, day by day, ever more hopelessly in love with her. Finally, Kent decided to ask her to marry him, to share with her the secret of his dual identity, and to abandon his super-heroic role as Superman forever in order to live out his life with her as plain Clark Kent. Lori, however, had already divined Clark Kent's secret by means of her telepathic powers, and although she loved him as much as he did her, she felt that marriage between a man and a mermaid was impossible and that her first duty was to return to her people. And so, recalls Clark Kent years later, "soon, under the sea, we kissed - and there never was, or ever will be, such a strange kiss again - the farewell kiss between a Superman and a mermaid!"